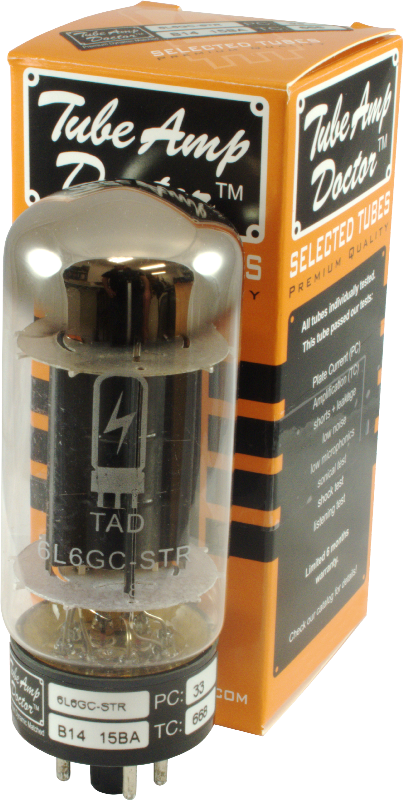 1 answers My current set of these tubes has a "7" rating and no plate current rating written on them .Will the new set I order be comparable plate current to these? To be honest TAD's matching numbers wouldn't correspond to the Groove Tubes style 1-10 system. I would suggest requesting higher numbers on the TAD tubes to get in the general ballpark. 1 answers Hello, I have a older Fender Vibrolux Custom Reverb black face amp in which has GT 6L6B power tubes starting to go bad. Can I use the RCA TAD SKU:T-6L6GC-TAD-X / Item ID:004734 in place of the bad ones? I play mainly blues, 60-70's rock and contemporary Christian music. I'm not a big fan of the JJ series as I've not been having good luck with them. I recently bought two JJ Rectifier's which did not fit right in a Limited Edition Deluxe Reverb and wound up putting in an TAD rectifier that fit perfectly and did the job. If there is a different set of power tubes that you would recommend for what genres I play that would fit right in the amp I would appreciate it. I put in two Celestion Gold's and want some nice tubes for it without breaking the bank. Definitely a step up in tone and clarity from the 5881 Tung-Sol re-issue pair that were in my Carr Rambler previously. Tubes do everything in my Carr Rambler that they claim to do which I guess isn't a surprise as Steve Carr puts them in his new production amps nowadays. Nice even low end and bright but not fizzy top. Selecting the correct phase inverter/driver tube is critical. I got the best results with a NOS Jan/Philips 12AXTWA. I have a fender blues deluxe reissue that I have swapped many tubes out of, 6l6's and 6v6's. I must say that these tubes are the best sounding tubes I have heard yet. I have tried JJ 6l6 and 6v6 and Groove Tube 6l6 and these just blow them all away. Very big sounding, warm and the bass is round and fat. Doesn't get to boomy. I say give these a try and you will like what your ears are hearing.